What is unprecedented in the Vogue Arabia launch is that it will go out first a bilingual website and then as a print magazine. Naturally what worries me is how to portray sleeveless dresses or fashion items that bare the midriff or ones that have thigh high cuts in societies which have little or no tolerance for this. Already the bare skin of the shoulder of Hadid would not have been accepted by other standards. 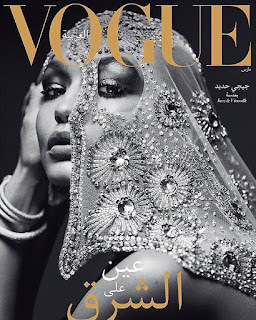 I am indeed, all for audiences where the magazine is to be distributed to see and want and covet the fashion they choose (which they already do if online or European shopping trip purchases are any indication), but could this be out in the open in a patriarchal society?